Knowe of Yarso is a Neolithic chambered cairn on the south coast of Rousay island, facing across the straits to the Broch of Gurness on Orkney Mainland. The oval cairn is made up of concentric walls around a central chamber divided into three separate compartments. 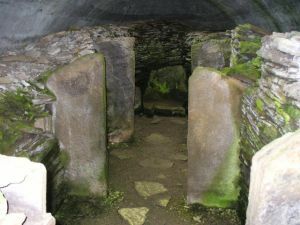 You can enter the burial chamber, which has been partially restored by Historic Scotland. There is a narrow passage leading from the east side of the cairn into the interior. The passage walls have masonry courses laid at an angle, presumably for the aesthetics of the pattern the slanting stones created. When the Knowe was excavated in 1934 archaeologists found the remains of at least 29 people inside. Most of these were found in the innermost chamber. Perhaps it was considered the most sacred spot? Seventeen of the remains had only a skull, and most of the skulls were carefully arranged, side by side facing inwards. Along with human remains were the bones of 36 red deer. Other cairns in Orkney have been found with a large number of bones from a particular animal, most notably the amazing Tomb of the Eagles on South Ronaldsay which was full of sea-eagle bones. This might suggest that the deer bones at the Knowe of Yarso were a tribal symbol of this particular community. Yarso is very close to two other chambered cairns along the same stretch of the B9064; Blackhammer Chambered Tomb and Taversoe Tuick Chambered Cairn, and just a few miles further west are the amazing ruins of Midhowe. Access at any reasonable time. Location: 3 miles west of the Rousay ferry terminal, on the north side of the B9064. Take the regular Tingwall ferry service to Rousay from Orkney Mainland. Nearby accommodation is calculated 'as the crow flies' from Knowe of Yarso Chambered Cairn. 'Nearest' may involve a long drive up and down glens or, if you are near the coast, may include a ferry ride! Please check the property map to make sure the location is right for you.